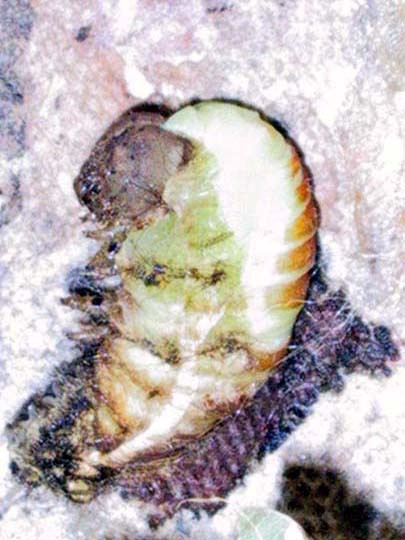 This silkworm is raised in China for its silk. 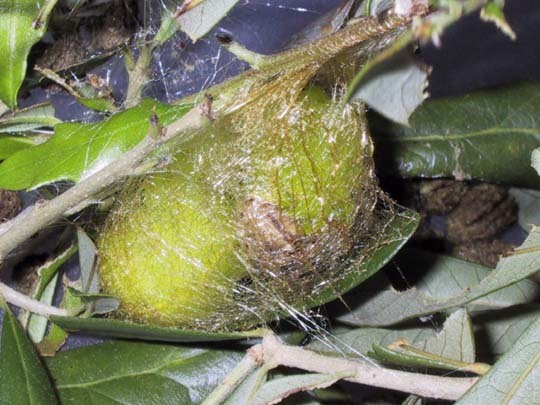 It is referred to as Tussah, Chinese Tussah, Oak Tussah, or Temperate Tussah. It is the source of Tussah spinning fiber that we use in the West. 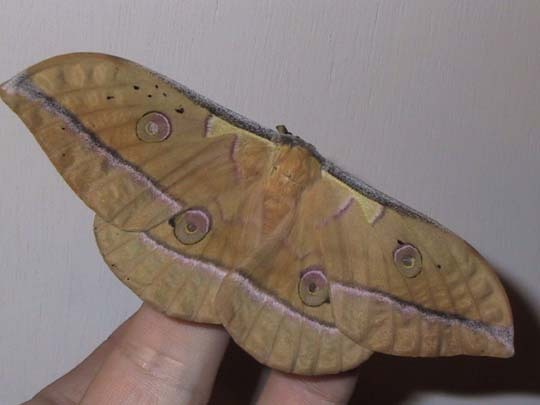 It is a relative of the Tropical Tussah silkmoth, Antheraea mylitta of India, and also related to Antheraea polyphemus, the American Polyphemus silkmoth. In China, they are fed on plantations of specially trimmed oak trees on the hillsides. They began to hatch on May 18, 2004. 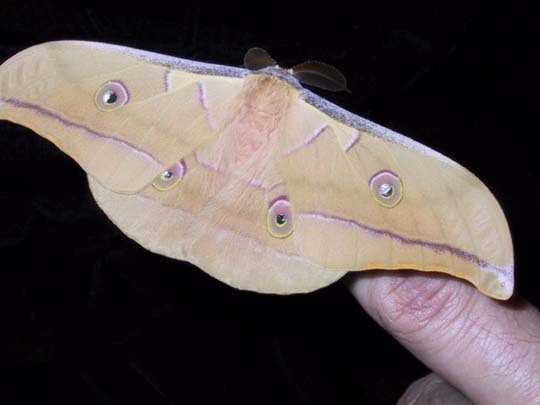 The eggs are very similar to polyphemus eggs, although they are a more solid color and lack the dark band. The hatchlings are solid black with brown heads, and very hairy. They remind me of the kego stage of Bombyx mori, although much larger. 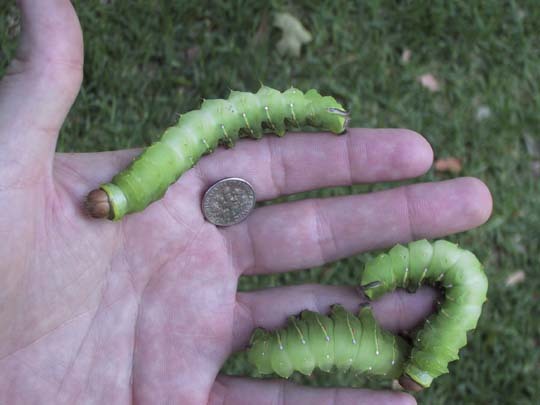 You can see that they're fairly big for hatchling caterpillars. May 18, 2004. After about five days, the hatchlings began to shed their first skins. It was surprising to see the black hatchlings turn to a pale yellowish green! 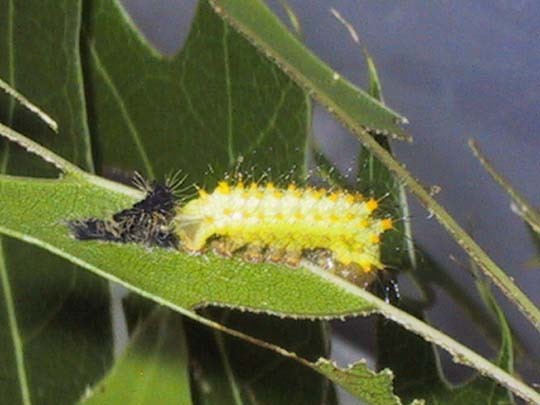 The shed larval skin is right behind the caterpillar, where it has walked out of it. May 23, 2004. 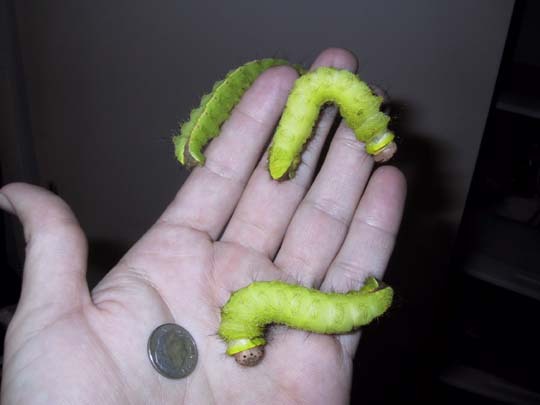 The second-instar caterpillars have grown quite a bit. May 26, 2004. 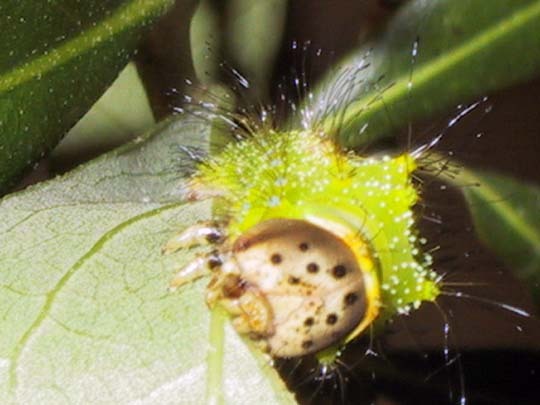 This caterpillar has just changed into its fourth instar skin. You can see the cast-off skin just behind it. June 6, 2004. 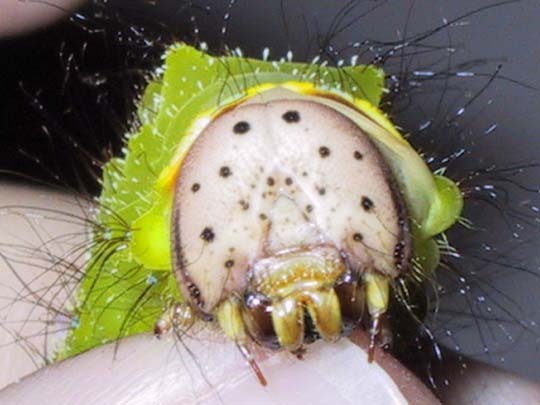 These caterpillars have charming freckled faces. 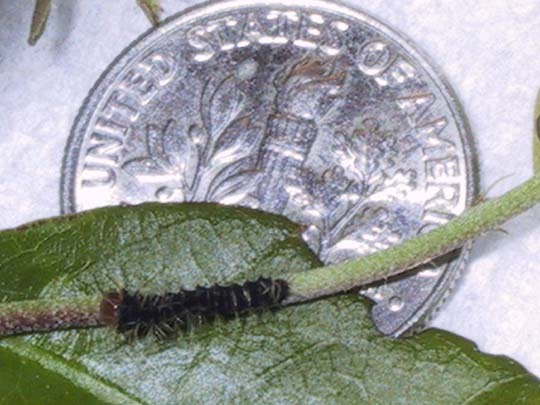 This is a fourth-instar caterpillar eating. June 6, 2004. It's been almost three weeks. 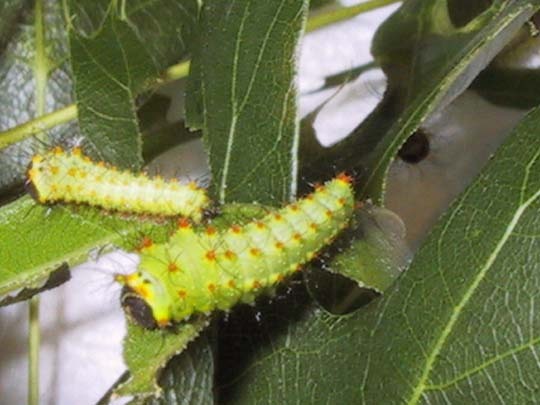 The caterpillars are now in the fifth instar, and really chowing through the oak leaves! They are about as big as my fingers. 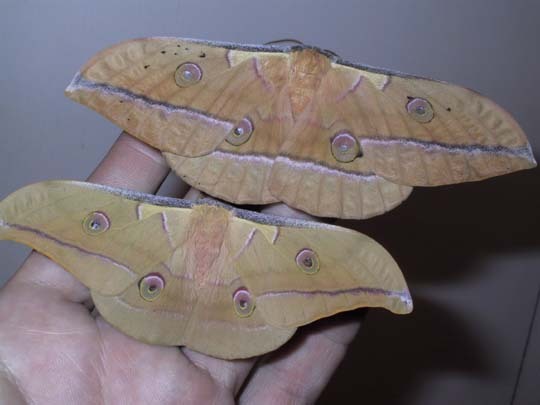 You can compare them to Polyphemus in a similar shot. June 27, 2004. 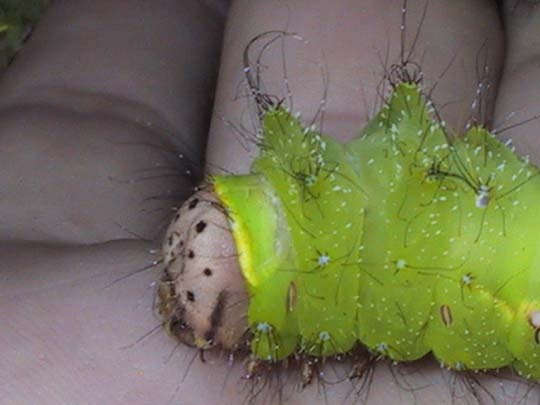 The pernyi caterpillars are a little hairier than the polyphemus. This one is wandering over my hand, searching for food. The freckles and all the hair show up well here. 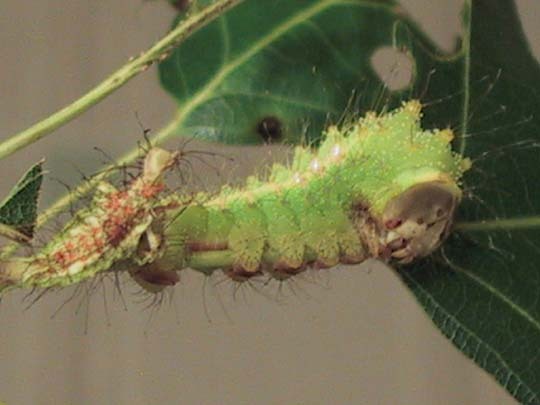 The mandibles are able to chew through the tough oak leaves very quickly. June 27, 2004. 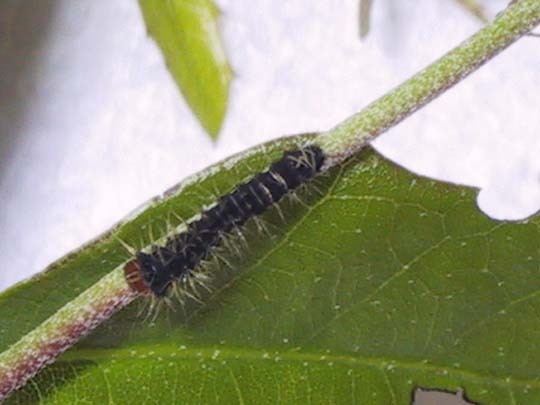 This caterpillar has already dumped out the excess food in his gut, and is about to start spinning. The pernyi caterpillars seem to be particularly shy - they stop whatever they're doing when I approach, and put their little feet into this "prayer" pose and sit quietly. Most of the other species just keep on eating or spinning or whatever. July 7, 2004. 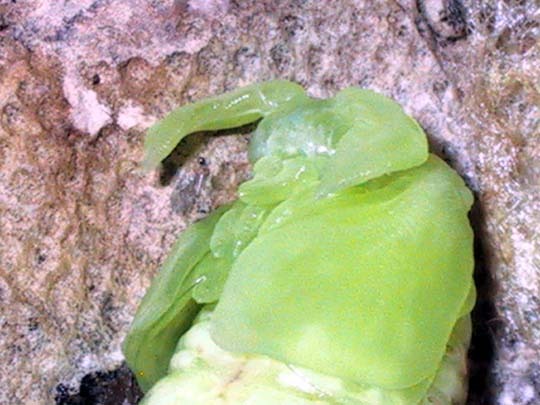 This caterpillar doesn't make a very tight leaf wrap before beginning his cocoon; a lot of it is open to the air. The silk is a pretty golden tan. 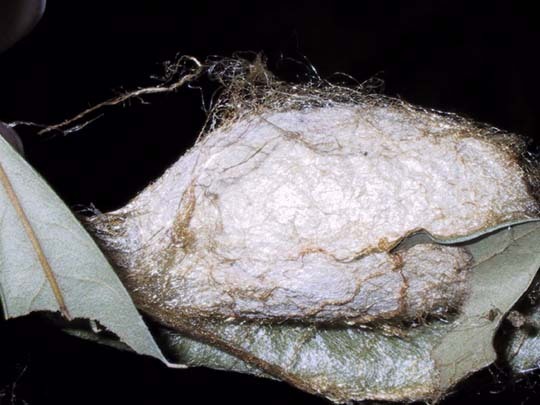 Here is a completed cocoon. It feels solid and hard, like papier mache. July 7, 2004. The following few photos are actually from the 2005 generation, but I'm including them here because they show the intermediate steps. I had never gotten to watch this happen, and it's really a magical transformation. This was previously the caterpillar of a Tussah moth. 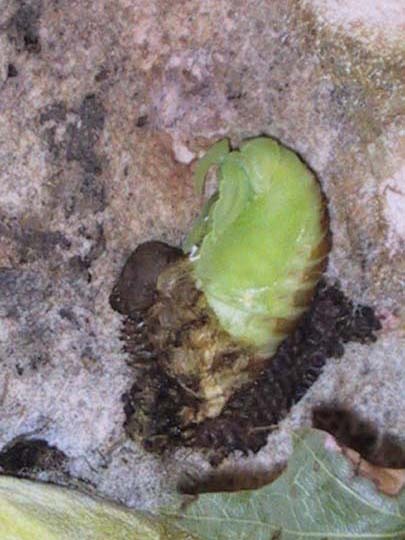 The caterpillar had already shortened up, becoming a pre-pupa. 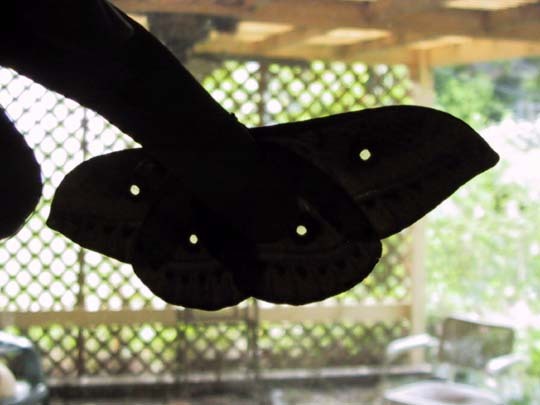 Inside the caterpillar shell, it was developing the proto-versions of its moth organs: antennae, wings, and legs. 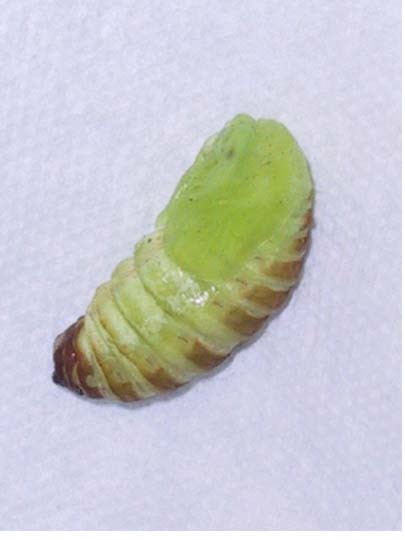 The pre-pupa is incapable of walking, and can only wiggle its midsection like a hula dancer, round and round. 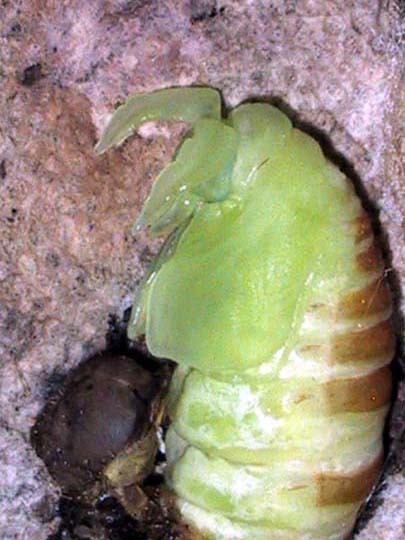 It began by shrugging its 'shoulders' back and up, splitting the caterpillar skin. Unfortunately, those shots didn't turn out - I was trying to get the camera to focus, and lost a few. If you can imagine someone shimmying out of a tight dress without using their hands, feet, or teeth, you can get a good idea of the motion involved here. Lots of wiggling, rocking side to side, swiveling of the backside. 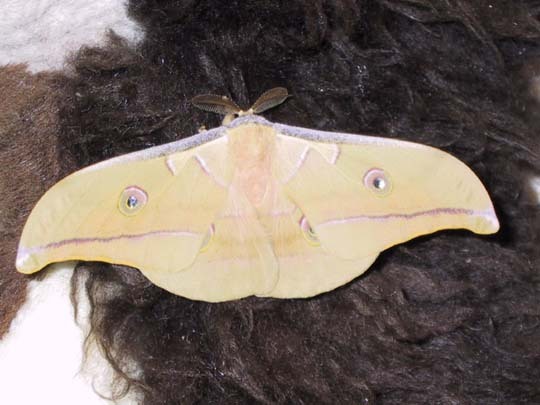 The antennae and wings are actually pre-formed already; they're not complete, but they are separate. This is what I've never managed to see before, is the in-between moment. It's a very magical but at the same time somewhat disturbing, kind of like seeing someone's leg bend the wrong way. In the close-up, you can see the shapes of the legs, the antennae, and the wings distinctly. The entire thing looks like it's carved out of delicate green jade, with brown patterning on the backside. To me, it looks very alien and strange, but beautiful. 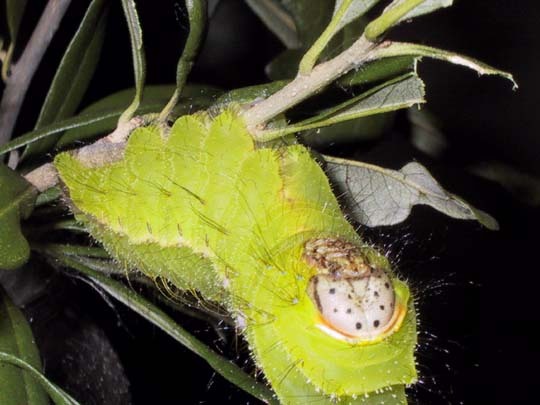 Within about five minutes of getting totally free of the caterpillar skin, the pupa has closed in, and the free-floating antennae and wings are attached firmly to the sides. The pupa will darken over the next couple of hours, becoming a nearly-black brown. We now return you to the 2004 generation, and the emergence of the moths! July 28, this handsome fellow hatched out! He's from the smallest of the cocoons, and has a wingspan of 4 1/4". I love the creamy colors! This closer shot gets the spots a little better; they're both translucent and highly reflective. Held up to a back light, the moth looks like it's got holes through it. 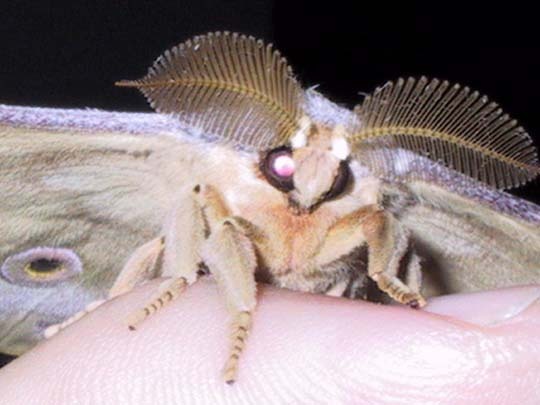 Closeup of the male's face with the huge fuzzy antennae. These are to help him find the female, following her pheremone trail. July 28, 2004. I was delighted to see a female hatch the night right after the male! I'm not sure whether they'll breed together (some moths are strongly resistent to inbreeding) but I'll be happy to let them try. July 29, 2004. Here's the pair, with the female above. She's quite a bit larger, with a wingspan of five inches. The coloring is a bit different as well. I had to take this backlit shot, because I love the "bullet holes" in the wings. They're reflective, translucent spots. July 29, 2004. Despite my concerns, the moths bred back into the line with no apparent difficulties. 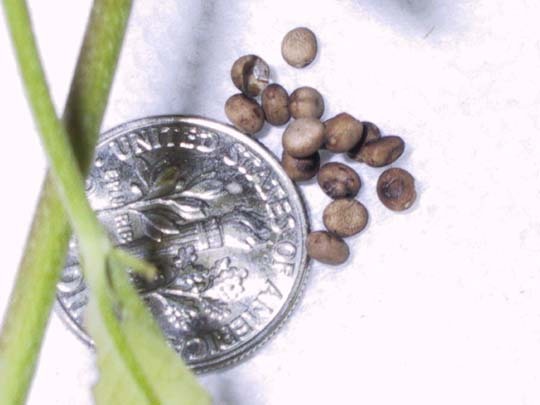 Depending on when in the season they hatch out, they may have a second, or even a third generation.